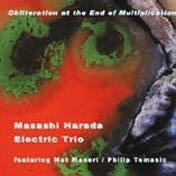 Masashi Harada (percussion, voice), Mat Maneri (electric baritone violin) and Philip Tomasic (electric guitar) have performed as a trio for several years. This is their first CD recorded by Mat Maneri in 1998. However, one should not be misled by the numbers, for Masashi first met Mat Maneri in 1986 when Mat was 16 and Masashi 24. As Masashi writes in his liner notes on technique in generative improvisation, "Mat and I breathed together musically for a number of years." Small wonder then, that their CD sounds like nothing you have heard before.